Buy it here. 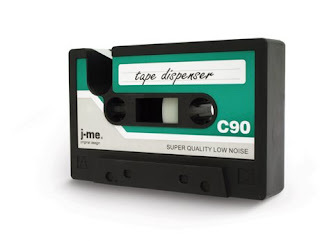 It Looks like tape but it dispenses sticky tape. I'm fascinated how nostalgia changes people's view of old technology. Or how old technology takes on a new meaning as it ages. For example, most programs use a floppy disk on their save button, but when was the last time anyone held a floppy disk? Then there are things that were commonplace, but now are nearly unseen - like this.